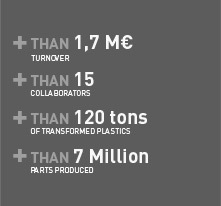 For over 60 years, OPS Plastique has been renowned for the quality of its products. We produce elements from 0.01 grams to 1000 grams with high quality engineering polymers selected by our technical team. These polymers (PEI, PPS, PBT, PA, PC, POM PVCR) and elastomers (PUR, TPE-E, PP / EDM, SEBS, and flexible PVC) all meet high performance criteria. With our experience in specific areas such as the transparent parts and fireproof materials, and a fleet of presses from 35 tons to 250 tons closing, OPS Plastique are committed to provide all our customers with high quality services and the best possible advice. In addition, the combination of our state of art, evolving technology (3 axis digital robots, manipulators, injection dedicated presses) and our powerful production capacity (3 × 8 hour teams for 24 hours a day production) in a clean and safe environment, we are confident we can guarantee of satisfaction for our customers. Our team of qualified technicians as well as the broad experience of our internal research department allows us to provide our customers innovative solutions and thoughtful advice. Recognizing the importance of this commitment to high quality, technical expertise and solid advice, our entire business is ISO 9001 v 2008 since 1999.